There's something for everything in this epic aerial of Istanbul, Turkey by contributor Turkey Home. 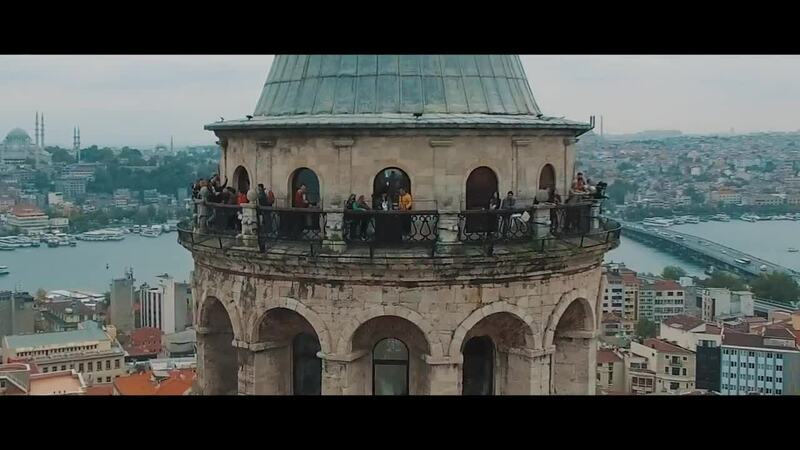 The video opens with a beautiful shot of the famous Hagia Sophia mosque, then proceeds to bird's eye views of Maiden's Tower, timelapse shots of some of the city's busiest streets as well as traffic over the new third bridge over the Bosphorus Strait, Galata Tower, ship traffic in the Bosphorus, and more scenes from this magnificent city which spans the continents of Europe and Asia. Description: Watch more Istanbul videos on Turkey.Home YouTube Channel: https://goo.gl/N953EN When a city has as many stunning sights as Istanbul, it’s best to get a good birds-eye view of the whole city before zooming in for a closer look! Matador Network’s “Istanbul from the air” does just that, showing you the city’s historic peninsula and downtown before crossing the bridge between two continents to give stunning views over Europe and Asia! Take a look yourself, and enjoy! Music: "Istanbul” by Mercan Dede, from the album “800" #Turkey #Homeof #Istanbul The story of “Istanbul from the Air”, from the words of Creative Director of Matador Network, Scott Sporleder: "Napoleon Bonaparte once said, “If the Earth were a single state, Istanbul would be its capital.” And I wholeheartedly agree. There are few cities on this globe that possess truly remarkable skylines, and Istanbul is one of them. It’s been a crossroads of humanity for centuries, and it holds a mystique you can’t really describe unless you’ve been there. When a city has as many stunning sights as Istanbul, it’s best to get a good birds-eye view of the whole city before zooming in for a closer look! Matador Network’s “Istanbul from the air” does just that, showing you the city’s historic peninsula and downtown before crossing the bridge between two continents to give stunning views over Europe and Asia! Take a look yourself, and enjoy! Music: "Istanbul” by Mercan Dede, from the album “800" #Turkey #Homeof #Istanbul The story of “Istanbul from the Air”, from the words of Creative Director of Matador Network, Scott Sporleder: "Napoleon Bonaparte once said, “If the Earth were a single state, Istanbul would be its capital.” And I wholeheartedly agree. There are few cities on this globe that possess truly remarkable skylines, and Istanbul is one of them. It’s been a crossroads of humanity for centuries, and it holds a mystique you can’t really describe unless you’ve been there. But its beauty isn’t often seen from the eyes of some of its oldest inhabitants: the birds. Spectacular as it is from ground and at sea level, Istanbul is amazing from the air. Shooting with both cameras on the ground as well as drones in the air (which Matador received exclusive permission to film with), we shot the minarets, the mosques, the bridges, the boats, the bazaars, the streets, the straits, and the sights of the world’s capital. Check it out and tell me you don’t think Istanbul is for the birds — and here, that’s not an insult The story of “Istanbul from the Air”, from the words of Creative Director of Matador Network, Scott Sporleder: "Napoleon Bonaparte once said, “If the Earth were a single state, Istanbul would be its capital.” And I wholeheartedly agree. There are few cities on this globe that possess truly remarkable skylines, and Istanbul is one of them. It’s been a crossroads of humanity for centuries, and it holds a mystique you can’t really describe unless you’ve been there. But its beauty isn’t often seen from the eyes of some of its oldest inhabitants: the birds. Spectacular as it is from ground and at sea level, Istanbul is amazing from the air. Shooting with both cameras on the ground as well as drones in the air (which Matador received exclusive permission to film with), we shot the minarets, the mosques, the bridges, the boats, the bazaars, the streets, the straits, and the sights of the world’s capital. Check it out and tell me you don’t think Istanbul is for the birds — and here, that’s not an insult"